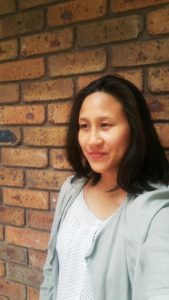 Su-May Tan is a copywriter and emerging author. She was a recipient of the Varuna Publisher Introduction Program 2018 for a short story collection and was shortlisted for the Deborah Cass Prize 2018 for her novel in progress. Her short fiction has been published in Tincture Journal, Sala Prize and Margaret River Press. She lives in Melbourne with her husband, two children and dog. My name is Katherine Chen. My mother died when I was five. There are signs around if you care to look. Like the jewelled comb in the sideboard drawer, or the framed batik prints on the wall. If you go outside, you can see a banana tree standing in the middle of the garden, probably the only banana tree in Narre Warren. “Why don’t we get rid of it?” I told Pa. He said, “No, just give it time. It will do better next year.” And so, we live in this house with a white picket fence and a banana tree that looks like it’s going to die. For someone who has lived in Australia for ten years, Pa spends an awful lot of time reading Malaysian news. Whenever he does, he gets really cross. There’s always some politician he’s grumbling about or some new occurrence that makes him annoyed. Diana often says, “You’ve left the country, why don’t you just let it go?” She says this in her psychologist voice, a soft, quiet voice that could be your own. It’s the same voice she uses when she sees me heading off to the park. Are you sure that’s a good idea? Will you get back before dark? One day, Dessi and I came back from school and she said, “Oh my god, there’s a banana on your banana tree.” She was right. I didn’t even know they grew that way. The red bud was huge now and it had little green fingers coming out of it. I should have suspected something then but Dessi and I continued to traipse past as if it was the most normal Friday in the world. “You’ve had this cough since we first met.” That was true. But that didn’t mean it wasn’t pneumonia. A grey cloud descended upon my room, blurring out the poster of Kimiko from Spirited Away. I put down my pen. The cloud swirled across my Algebra book and transported me into the dark and foggy place I sometimes found myself in. My heart began to beat fast, too fast; and I couldn’t breathe. “You’ve got a message,” said Dessi. “Message,” she said, pointing to the lighted up screen of my phone. When I saw the name – John Ichuda – I felt like I was flying. Hey…Do you want to go to the Spring Dance with me? It was all I could think about that night as I looked at this Chinese girl in the bathroom mirror staring back at me. Should I wear the blue dress from Sports Girl? Was I getting a pimple on my forehead? As I chucked the toothbrush into my mouth, I saw the cat. I hadn’t seen it since I was nine. “A possum, you mean?” said Pa.
“No, a cat,” I said, pointing with my stubby finger. But when he turned to look, all he saw was the swing, and a pile of leaves where the cat had been. The cat at the window now stared at me. Could it be the same one? How many stripy cats were there in the neighbourhood? I couldn’t forget those yellow eyes. It blinked once, twice, then disappeared into the darkness. Later that night, the eucalyptus tree tapped me on the shoulder, and the cat appeared again. The yellow eyes continued to burn. The cat began to change. First, it turned into a possum, then into a fox, then into a tawny frogmouth, like the one in Mrs Smyth’s garden. The next morning as I padded down the stairs, I knew something had happened. The light seemed especially bright, as if everything around me was made of crystal. I could almost hear a shimmery tinkle as Diana’s voice cut through the air. “Will she be there?” There was no reply, only the sound of boiling water. “Hi Katie,” said Diana when I walked in. Pa continued to talk. He must have told me the details: how she died, who was there and what we had to do, but my mind was too busy thinking about John Ichuda and the date of a lifetime we would never have. I could even see the dress I would wear, a twinkling mass of gossamer blue, slowly disintegrating into nothingness. “Just a couple of weeks.” Diana stirred her mug. She kept stirring it as if trying to dissolve the spoon. “Are you going?” I said to Diana. “I can’t sweetie, I’ve got to work.” She took one more sip and got up. Her cup made a cold clinking sound on the table. I watched her wash her hands and flick them dry. After she left, the smell of her dewberry shampoo lingered in the room. The sliding doors opened and the day hit me like a wall of hot air. Trolleys rolled left and right. Signs said exit in three different languages. Out of this haze, a lady appeared. She called Pa by his Chinese name and gave him a hug. This was Tua Ee. For the longest time I thought that was her Chinese name. It meant Eldest Aunty and that’s who she was to me. “Hello, Tua Ee,” I said. “How are you?” I leaned forward to give her a hug and she hesitated just the very slightest. A cloud of perfume floated around me as I wrapped my arms around hers. She let out an embarrassed laugh. “How was your flight?” she said to me. “What’s that?” she said, pointing at my feet. “My mum played the piano,” I said. Two stewardesses sashayed past. Their sandals made slapping sounds on the concrete. “She means Sue,” said Pa softly. Tue Ee gave a little gasp and clasped her Chanel handbag. “We better go,” she said, glancing at her watch. “The traffic is going to be very bad.” With that, she made her way to the other side of the car and clicked opened the door. Palm trees and billboards followed us all along the highway. In the rear view mirror, Tua Ee and her eye brows peered at me. She said Roy and Maggie were looking forward to seeing me. How old was I? Sixteen? That’s just one year younger than Roy. We kept on passing rows and rows of oil palm trees. After a while, they changed into jungle, huts, and then more jungle. Finally we stopped at a large boom gate. In fact, every lane had a boom gate in front of it, beside which was attached a booth, and inside, a person collecting money. Tua Ee dug into her handbag and handed the lady a few dollars, after which the lady raised the barrier and let us through. It was like opening the floodgates to the city. The jungle disappeared, and was replaced by petrol stations, hotels, rows of shopping strips, and a monorail zipping between them all. “What happened to Jalan Templer?” Pa said. Pa looked out of the window thoughtfully. I wondered what he saw. I saw a bus stop, a mosque, a shopping mall. At the traffic light, a woman stood draped in black from head to toe. The only thing visible was her eyes. She squinted into the hot blustery wind as Justin Bieber sang, You’re my baby, you’re the one. The door grill creaked opened. “Uncle Patrick,” whispered Pa to me. I watched him stomp to the car in his blue flip-flops, and back again to the driveway, two grocery bags in hand. Tua Ee continued to bark orders at various people. She asked Roy to help with the suitcases. She asked someone else to hold the door open and someone else to bring in the pomelos. Pa took his shoes off at the door, I did the same. We went to the kitchen at the back where a table was laden with food. A girl with short curly hair came to greet us – could this be Maggie? “Did you do a marathon?” I said, pointing to the words on her t-shirt. She grinned at me shyly. “Some tea would be nice,” I said. Tua Ee spoke to the girl and she came back carrying a yellow carton. “Thank you,” I said. “I’ve never seen tea like this before.” The girl laughed, displaying a grid of teeth. “What is it?” I asked Tua Ee. “She says she can’t understand your English.” She introduced me to Siti then, her helper from Indonesia. The grown-ups began talking about politics. They talked about scandals and the coming elections, and this guy, Tun Said, who was the leader of some Islamic group. I, on the other hand, examined the food in front of me: fried noodles in black sauce, and okra stuffed with fish paste. I chose an okra, which Tua Ee called a ladies’ finger. She said I was ‘very clever’ to eat it, though I wondered what kind of intelligence one needed to consume a vegetable. Maggie sat on the couch in a stylish red blouse. She did not look like Siti at all. Her skin was flawlessly white. From time to time, she would play with a pendant around her neck. “Your hair is so nice and thick,” she said. I watched Maggie talk to her friend in Chinese. It could have been birds at the park. “Do you speak Mandarin?” she said. “Well, my father is,” I said. “Yes,” I said, feeling a prickle in my neck. A Korean singer appeared on TV and I said he looked a bit like George Shane. “Oh,” said Maggie without meeting my eyes. Not long later, another one of Maggie’s friends came over to talk to me. She started asking me all sorts of questions about Melbourne. Did all the houses have swimming pools, how cold was it there, can you see kangaroos everywhere? That’s when the prick on my wrist happened. “Where are we going?” I said, as everyone started to stand up. “Didn’t we just have breakfast?” I said. The Chinese restaurant we went to was nothing like its namesake on Little Bourke Street. I snapped Dessi a photo of the sign. It had a zinc roof and cheap plastic furniture. A stray cat weaved through the chairs, hoovering up scraps of rice from the floor. We went to an indoor section, which was marginally fancier. The tables were clad in red table cloths. There was a Chinese painting on the wall and an air-conditioner spewing out mist. When the tea arrived, Roy poured it out into little porcelain cups for everyone. He responded to my queries about what each dish was. Four Seasons with a jellyfish salad. Fried fish with plum sauce. The highlight was the crabs; a shiny, vermillion platter of crustaceans whose brethren were eyeing us from a tank across the room. “That’s for washing your hands,” she said and everyone laughed. When we got back to Tua Ee’s house, Maggie and her friend returned to the couch. I wandered off to the living room, where I found Uncle Patrick poring over some newspapers. “Mat-Rem-pits,” he said, more slowly. He showed me the page. Everything was in Chinese but the picture showed a group of men on motorbikes. There must have been about a hundred of them, filling up the whole street. “Who are they?” I said. “No thanks,” I said. I suddenly felt like I needed to get some air. Everything was so stifling. A hot wind blew from the window. There was a ceiling fan but it simply whipped the heat up into pieces. “What are you doing?” said Uncle Patrick, peeping at me from behind the papers. “Going for a walk,” I said. He peered at me curiously. Then he sat back in his seat and lifted up the wall of papers again. I only made it two roads down before realising that taking a stroll in KL was not the brightest idea. I had never felt heat like this before. It was hard to breathe and it made no difference whether you walked in the sun or the shade. I reached a kind of lookout point with the Twin Towers in the distance. A construction site sprawled below me, and next to it, a group of men were queuing up with buckets clutched in their arms. Their bare backs gleamed in the sun, as they waited for the man in front to finish with the tap. Suddenly, one of the men looked up at me. I quickly turned away – as casually as I could. Then I stepped back and made my way back to the road. Cars passed by so close I could feel the wind against my skin. Every time I heard an engine, my heart seized. I imagined someone grabbing my bag or ripping my arm off like the lady in the newspaper. I sensed the car before I heard it. You can tell when a car slows down. The men made a screechy sound with their teeth. “Moy,” they said, as if it were my name. “Moy!” they said again. The car picked up speed, then just as it passed, I saw the bold blue words ‘Polis’ written on the door. ‘Pete’s Place’ really was a place called ‘Pete’s Place.’ There was a large metal sign hanging on the door. It looked like a restaurant but no one was eating. People just hung around in groups, chatting or fiddling with their instruments. Roy found us a table at the back and we watched a few bands play. Some sang in Mandarin, some sang in English. There were posters on the wall – ads for things like coconut juice and a new Indian restaurant that had ‘Malaysia’s Best Tandoori Chicken.’ The most prominent flyer was for something called ROM, the Rock On Malaysia concert. There were like ten sheets plastered across the wall, so from a distance, it looked like ROM, ROM, ROM, ROM, ROM. After Roy’s session ended, we sat in a circle on the floor. One of the guys started picking at his guitar. Then another guy started tapping a drum. It became some kind of impromptu show, even Maggie was on the maracas. “I thought you play the violin,” said Maggie. Suddenly, I found someone thrusting one into my hand. All eyes were on me. I picked up the instrument and started playing the song I was currently learning – Beethoven’s Concerto Number Five. I even did the trill at the end. When I finished, the whole room was quiet. It was like the world had stopped. “That was good,” said Roy. No one else said a word. Roy looked at Maggie, Maggie looked at the floor. Then just like that, everyone started talking about the ROM.